12V accessory outlet in cabin. 12V AM/FM single CD with six-disc CD changer, eight (8) speakers and digital cockpit remote control. Blossom cherry interior finish is standard (also available in natural maple). Companion bench with molded fiberglass storage. Dedicated cooler storage in cockpit. Electrically actuated engine compartment hatch. Innerspring mattress is standard in forward stateroom. Optional fiberglass hardtop with full enclosure. Satin nickel finish push button knobs and switch plates. Standard LCD flip-down flatscreen TV with DVD in salon. Standard SmartCraft? instrumentation and System View. Swivel bucket helm seat with flip-up thigh-rise bolster. Ultraleather HP standard on all interior seating. 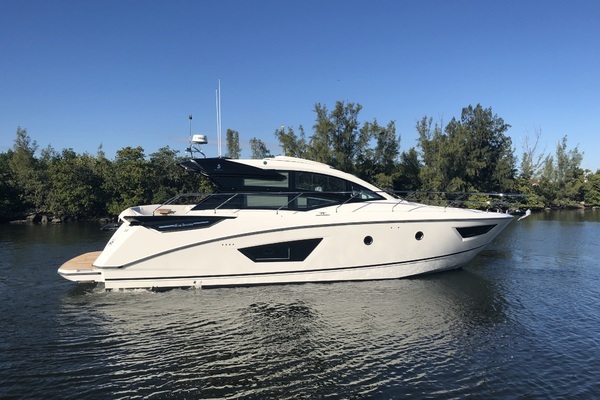 The Sea Ray 390 Sundancer (called the 40 Sundancer from 2006 to current) is a sleek hardtop express with the desirable flag blue hull. She appeals to quality conscious buyers with a taste for style, and luxury. Easy to handle with power steering and quiet with underwater exhaust. 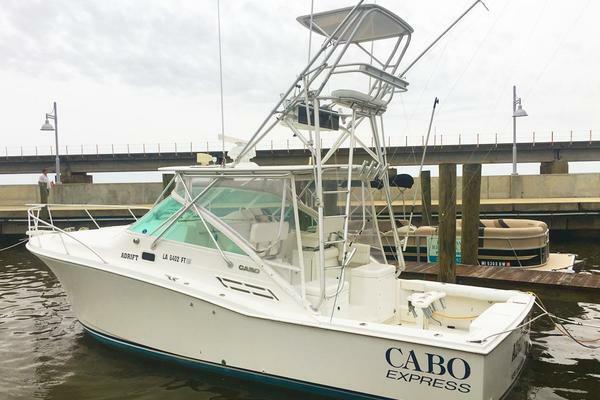 A posh mid cabin interior with Tommy Bahama accents, and a private forward master with a separate head entry gets high marks for tasteful decor and well placed amenities. The fully equipped galley boasts handcrafted cabinets, solid surface countertop, plus separate under-counter refrigerator and freezer. The roomy helm has a fiberglass hardtop with crystal clear strataglass front enclosure. The large cockpit has an optional camper enclosure and blue underwater transom lights. Don’t let this outstanding opportunity pass you by!